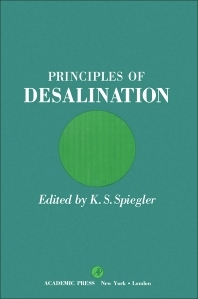 Principles of Desalination focuses on the principles of the developing technology of large-scale desalting. This book presents the principal desalting methods and explores the process of hyperfiltration or reverse osmosis. Comprised of 11 chapters, this book starts with an overview of the water use and the problem of a potential water shortage. This text then discusses the fundamentals of the major desalting methods in use and explores the basic scientific and design principles that underlie the methods. Other chapters consider the method of vapor reheat distillation, which incorporates the liquid–liquid heat exchange principle. This book discusses as well the various aspects of ion exchange and explores the mechanisms in dual-purpose plants producing both distilled water and steam-turbine raised power. The final chapter considers the cost of conventional water supplies. This book is a valuable resource for technologists and scientists. Students in the graduate courses of engineering will also find this book useful.